Secondary school at the ISB is guided by curriculum frameworks from the International Baccalaureate Organisation (IBO). Education is grounded in the IB Learner Profile – a set of learning outcomes that we strive to cultivate within our students. 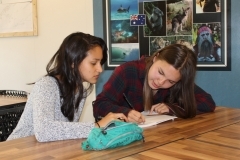 Teachers design lessons within the framework of the IB to create rigorous, relevant and engaging learning experiences across a wide range of subject groups. The first five years, for students aged 11-16 years, are based on the Middle Years Programme (MYP) of the IB. This is an enquiry-based programme of study which will provide your son or daughter with a personalised learning experience, helping them to uncover interdisciplinary connections. The MYP is a complete and coherent programme that provides a framework of academic challenge and life skills appropriate to this stage of adolescence. The MYP serves as a challenging but smooth transition from primary school into the last two years of secondary education. After completing the fifth year of the MYP, students can move on to Diploma Programme to complete their secondary education. The DP is a two-year, academically-challenging, pre-university programme for students between the ages of 16 and 19. The programme is designed to give students the knowledge and skills they need to pursue higher education.